Slingshot Kiteboarding welcomes James Bedford to the national team. WE can expect a lot from Slingshot downunder this year. Not only have they reestablished a dealer network around the country but they’re building a team of rippers to put the product on show. Why Slingshot? Why not? The Gear is amazing and it holds up after an intense beating. Foot-straps, boots or strapless? Why? Boots compliment my style and allow me to go bigger and ride with more power. What does competition mean to you? It’s all about going big. What was your favorite riding vacation? Heading to Perth each summer to the warm water and just spending every day on the water ridding hard with mates. Tell us about your quiver, kites and boards… I ride the RPM and the Vision board, for me this is the perfect combination to go big and ride powered. Any contest results we should know about? What is your favorite riding trick? A powered S3. What’s tops on your playlist now? Saviour – Rise Against. Your favourite food is? Chicken and brown rice. What do you do when you’re not kiteboarding? Hit the Gym and watch kiting videos. Who inspires you on the water? Pretty much anyone who goes huge and involves risk factor into their tricks. Who inspires you in life? My Dad. What your goals in the sport? To compete against the worlds best and win, also to land everything doubles. Any parting words of wisdom? Life isn’t about waiting for the storm to pass, Its about learning how to dance in the rain. 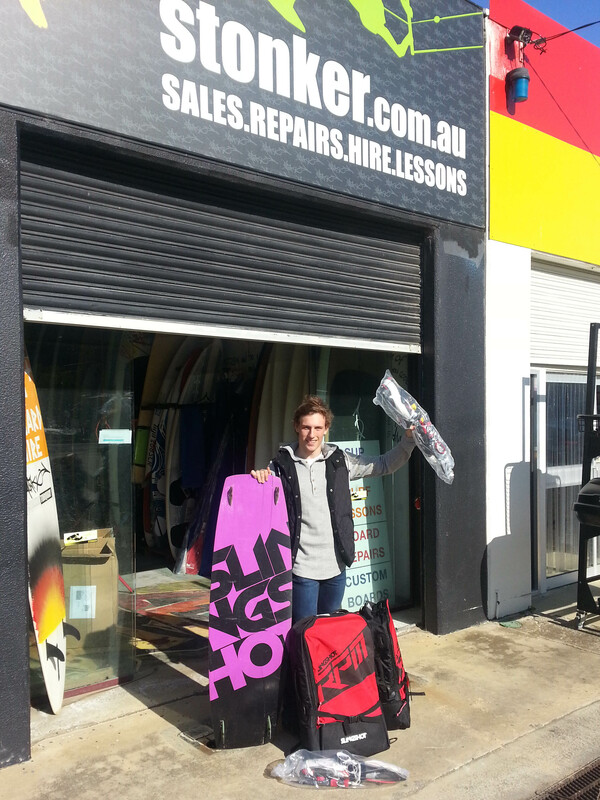 James Bedford with his setup the Slingshot Vision and RPM kites.